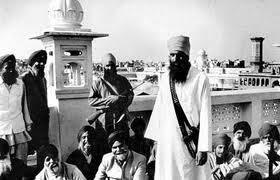 The Sikh Review of 1984 brought back memories of meeting Sant Jarnail Singh Bhindranwale Ji. Please read the original article I've scanned on facebook at this link, "Bhindranwale-Heralding in a Revival" by Swarandeep Singh: https://www.facebook.com/photo.php?fbid=10202909770364642&set=pcb.10202910297097810&type=1&theater. "Bhindranwale happened to be residing in the same rest house that we were staying at, Guru Nanak Nivas, so we climbed up on the roof where Bhindranwale spent much of his time......"
"......Bhindranwale's men and befriended many of them. He would go with them to the Harimandir Sahib every night, just after midnight, to do the seva of cleaning the floors. From there they would go to the Akal Takhat for more seva. The Indian media portrayed them as goons and terrorists; Baba Nam Singh said that he found them to be intelligent and devout men who were there because they believed in their cause. When he explained the Khalistan movement to me I was excited. I wanted to be one with Indian Sikhs. Fight with them. Die for them. I was back to the old militant mindset, and it felt good."